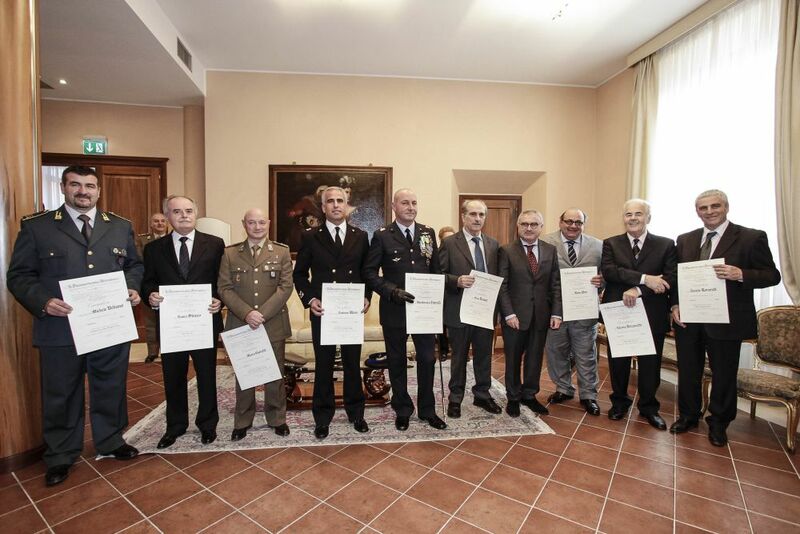 On Tuesday, November 6, 2012, at 12:30 p.m., the Prefect presented the honorary distinctions of “Cavaliere dell’Ordine al Merito della Repubblica Italiana” (Knight of the Order of Merit of the Italian Republic) to nine citizens of the province of Rimini. The Merit Awards of the Republic are conferred by decree by the President of the Republic, aiming to “reward merit applied towards the nation in the field of literature, arts, economics and/or the carrying out of public functions or activities with social, philanthropic and/or humanitarian purposes, as well as for long and notable service in civilian and military careers”. Such awards, the Prefect specified, have a substantial moral value and are an example for the nation and for all citizens. Mr. Gino Donati, resident in Cattolica, founder and director of “Universal Pack S.r.l”, world leader in the production of sachet machines operating in the food, chemical, pharmaceutical and cosmetic industries, based in San Giovanni in Marignano (RN). After the ceremony, which was held in a simple spirit, the Prefect addressed the honored individuals, and their family members who attended the ceremony, with expressions of appreciation and esteem for the deserved recognition, along with his personal congratulations.